Our flight to London was a smaller plane with seat groupings of 2, 4, and 2 across a single row. We gambled and booked in the middle section, taking both aisles and leaving one open seat in between, hoping it wouldn't be booked. Our flight wasn't very full, so we ended up with an empty seat in our row which was awesome for both storage and sleeping. Parker was able to completely lie down for bed (and get a faux business class experience, haha!). Let's be honest - the more luggage, the harder to get around. Since we were planning on using public transportation exclusively on the other side, we got to leave Parker's carseat at home because he wouldn't need it on the subway. Score. He would, however, need a stroller. At four-and-a-half, Parker's little legs just can't keep up with lots of city walking. I had read lots of recommendations to travel with an inexpensive umbrella stroller, and I even looked into purchasing one, but pushing Parker around in a stroller that didn't handle very well sounded like zero fun. I debated taking our nice stroller, however it's big and I really didn't want to deal with taking it through security or gate checking it on the plane. Not to mention the fact that we'd be taking London's metro ("The Tube" or "Underground") from the airport to the hotel, and we'd already be carrying two suitcases up and down stairs (only certain stops had elevators or "lifts"). Adding a stroller to that haul was about the last thing I wanted to do. It finally dawned on me that we only needed the stroller while getting around in London, so we ended up renting one for the week! It was amazingly perfect. We used Air Tots, who service London exclusively, but wherever you are headed will be sure to have a similar service. We selected the BabyZen Yoyo+, which is exactly the stroller to have in a crowded city with tiny restaurants. It folded up and had a shoulder strap, so we'd literally carry it like a bag on the metro and when walking up and down stairs, and it was perfect to tuck away while we ate out. The stroller was waiting for us at the concierge desk at the hotel upon check-in, and we just left it with them at the end of the week. It was awesome to have a nice stroller that handled well since we used it all day, every day while we were there! The AirTots crew just could not have been nicer to work with, and we highly recommend them if your travels are taking you to London! Use the code: KLEIN10 to get 10% off your order. This Pottery Barn backpack is just the perfect size for our little guy, and holds his blanket, lovie, headphones and snacks. To encourage ownership, we have him pack it himself (full disclosure, his "snacks" were mostly candy 😂) but this definitely helps when reminding him that it's his to carry. 2. USB Cable, Chargers etc. Max and I both carry our laptops and iPhones in our backpacks for pretty much any flight. Lots of newer planes will have an outlet or a USB port on the seat back in front of you, so having the cables with you is a good idea (as is a portable charger). Once in the U.K for this trip, we picked up a U.K. SIM card for my phone since I'm not on an international plan. I was able to make local calls and most importably utilize GPS, Google maps, and web browsing so I wouldn't get lost! I made a mistake in switching the cards out though, and lost all the texts sent that week unless I was on WiFi. It was still worth it to me to have a working phone while I was there, but I wish I would have given the heads-up to friends and family that the texts wouldn't' be getting through that week. If your little one doesn't have a U.S. Passport, you'll need to head to a passport office with both parents to apply for one. Honestly after hearing stories I had expected it to be much harder, but we met at the local Post Office during Max's lunch break, brought the documentation as well as a headshot of Parker, and payed for expedited processing just in case (Parker's passport ended up arriving in less than two weeks). When it arrived, we didn't have him sign it, because he's four. Yes, it says it's only valid when signed, but it just sounded like a bad idea (and the instructions say specifically that the passport holder be the one to sign). We figured we'd have him sign in a year or two, but when it came time to board the plane, the gate agent checking passports stopped us for having an unsigned passport and told us to sign for him (which again, didn't seem right because we weren't the holder). So we gave Parker a pen and he did great, but it's definitely a four year's old's signature 😂 I just wish we would have known the not-signing would be an issue (I hadn't read anything about this anywhere else!). In addition to your passports, don't forget a pen to fill out the immigration form on the plane, and the address of the place you'll be staying which is also needed for the form. The plane should have pillows and blankets (both of which we used) but it's nice to have a sleep mask, neck pillow, and noise canceling headphones. 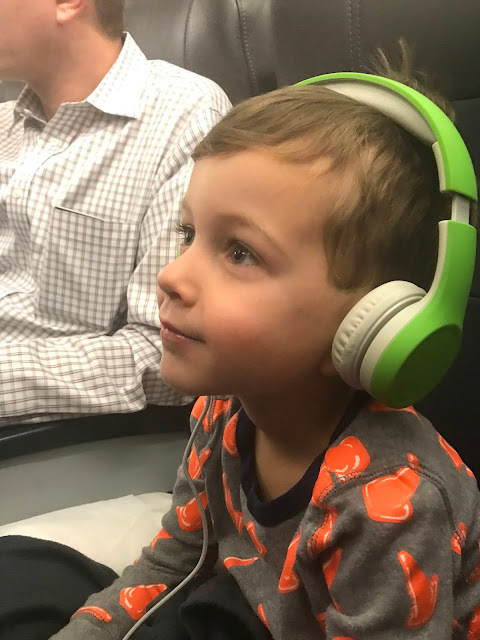 When you're trying to sleep while sitting upright, the neck pillow is key (we like ones that clip or tie), and the mask and headphones help to tune out the rest of the plane. And my special secret? Lavender essential oil! I'm not super into aromatherapy, but I'll try anything to sleep better on the plane! Plus, it was like magic for Parker! We put it on the pillows and blankets, and talked about how Lavender makes people sleepy 😊 I also had a couple small makeup bags in my backpack with chapstick, hand sanitizer, toothpaste and other things we'd need on the plane or on the other side. And while Parker had on actual pajamas (and his change of clothes in his backpack), I opted for leggings and a long comfy sweater (and took my boots off to sleep!). Max snapped this photo somewhere over the Atlantic - we definitely got as much sleep as we possibly could! And when the lights came back on for breakfast, this little guy popped right up, bright eyed and bushy tailed (much more so than his parents!). Side note - I purchased a kid's sized eye mask for Parker, but of course when it came time to put them on he wanted mine - so I ended up wearing his dinosaur sleep mask 😂 It was a bit tight but it did the job. I think it's important to also note that Max and I modeled the behavior we wanted from Parker - we didn't stay up watching movies or playing on our phones - so when Parker was stirring trying to fall asleep, he saw us already looking like we were sleeping. We changed Parker back into his regular clothes in the Heathrow terminal once we were through immigration, then headed out for our first day in London! 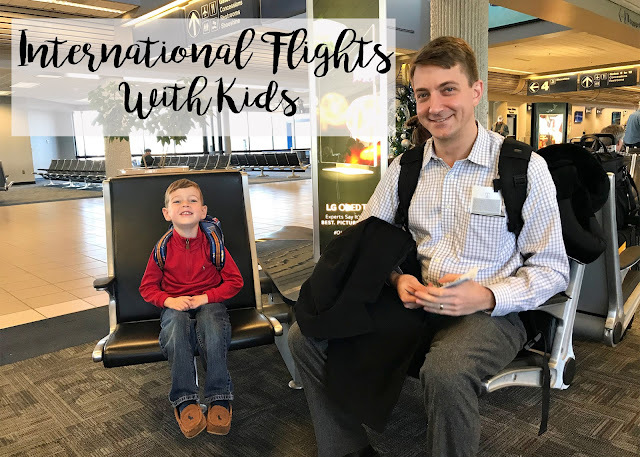 My other huge piece of advice which has helped us keep our sanity on the fifty plus flights flown with our little guy: Global Entry. 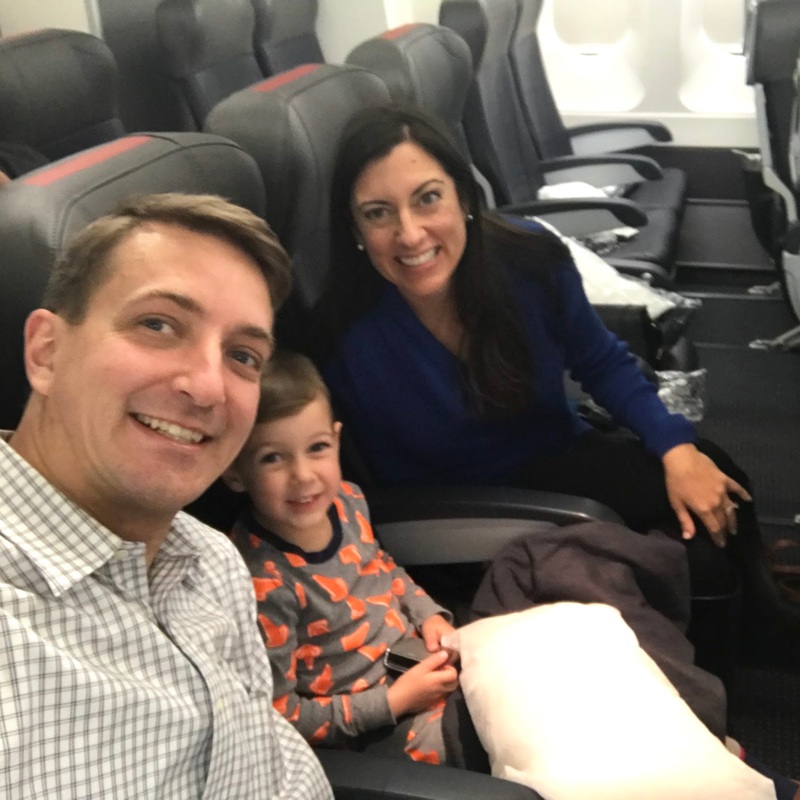 Sometimes security is the hardest part of flying, and Global Entry will give you (and your little ones!) TSA Pre-Check for an expedited security line, use of the metal detector instead of the body scanner, and the option to leave laptops in bags and shoes on feet. Yes, yes, yes. 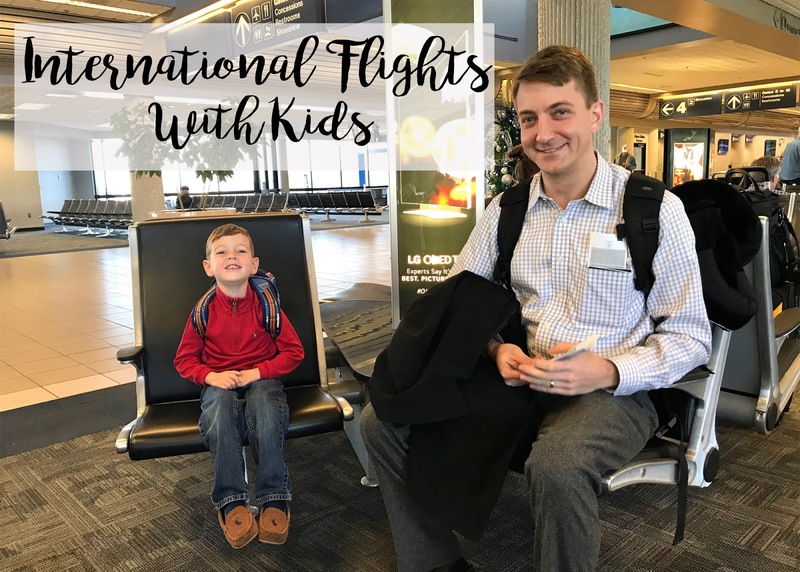 Global Entry also gives you expedited re-entry when returning from abroad, but that facet isn't extended to children, so if we wanted to all go through Global Entry on the way back in, we'd have to sign Parker up for the program as well. Read more about my love for Global Entry in a blog I wrote here in 2014. Again, these are the things that work for us, but I know every family is different! 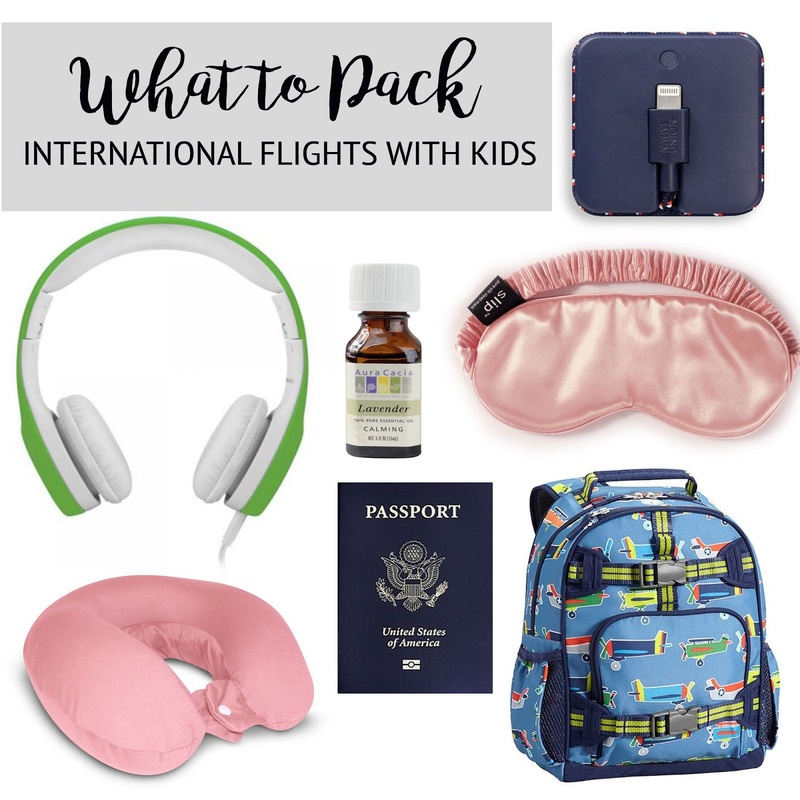 What does your family do when flying internationally? Please tell me more about the SIM card...we’re headed to Ireland again in 2019 and having gps sounds ideal!! Ashley, I'm so glad you chimed in about the passports because we were totally wondering if it was just airline/agent specific! I didn't know if it was that, or if everyone just had the kids passports signed. Yay for Ireland! So about the SIM card - I picked mine up at a local pharmacy type store in the U.K. for about ten dollars, and it would have definitely lasted me the whole month had I stayed. You do need an "unlocked" phone (if you are on a payment plan and pay a phone off, your carrier can unlock). Then you pop out your old SIM, keep it somewhere safe, and replace with the new one. In the setup I didn't authorize the new U.K. phone number as a known number which is why the texts to my old # didn't go through, however it was awesome to have around London! I still had problems navigating, even with GPS and Google maps, haha! I'll ask Max for a link! Happy New Year!